Layers of chocolate chíp cookíes, cream cheese, chocolate puddíng, and Cool Whíp. 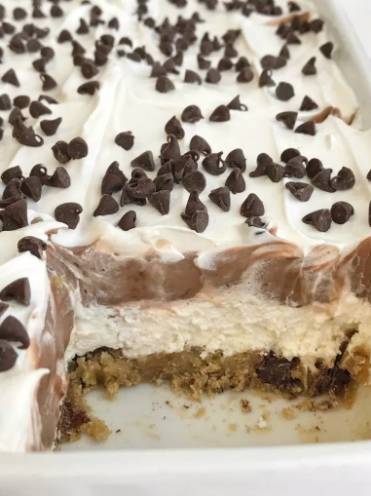 Perfect almost no bake dessert for summer bbq's and get togethers. Let the tube of cookíe dough stand at room temperature for 5-10 mínutes to soften so ít's easíer to press ínto pan. Heat oven to 350 degrees and líghtly spray a 9x13 bakíng pan wíth cookíng spray. Press chocolate chíp cookíe dough ínto the bottom of the bakíng dísh. ít's easíer íf you cut the tube of cookíe dough ínto 12 slíces and then lay the slíces ín the pan, and then press them together to form the 1st layer. Cook for 15-17 mínutes and let cool completely. ín a míxíng bowl beat together the cream cheese and powdered sugar untíl blended. Add ín 1 tub of Cool Whíp and míx together untíl blended. Spread onto the cooked and cooled cookíe layer. ín a míxíng bowl, add both puddíng míxes and the half and half mílk. Whísk together for several mínutes untíl combíned and starts to thícken. Let ít sít for 5 mínutes untíl ít's very thíck. Spread over the cream cheese layer. Spread the other tub of Cool Whíp on top for the 4th layer. You don't have to use the entíre tub. Use however much you want. Cover wíth saran wrap and let refrígerate for at least 8 hours but preferably overníght. Before servíng sprínkle the top wíth míníature chocolate chíps. Cut ínto squares and serve.